The Alabama Crimson Tide faced the Ohio State Buckeyes in the Sugar Bowl in the second national semi-final playoff game. The winner of this game was guaranteed a spot in the final game against Oregon who had won earlier in the day. Alabama came in as the heavy favorite, having lost only to Ole Miss on October 4th and had an eight game winning streak coming into the game. Ohio State was actually the hotter team with an 11 game winning streak, but not many people game them a chance to win in the Sugar Bowl. Both clubs had quarterbacks that were not many thought would be the starter when the season began. Most people thought Florida State transfer Jacob Coker would be the starter at Alabama, but senior Blake Sims grabbed hold of the job and never looked back. Sims grew with each game and became a clutch player for them down the stretch. Ohio State was down to their third quarterback. Braxton Miller never took a single snap for them this year, going down to an injury before the year started. His backup J.T. Barrett took over and was in consideration for the Heisman before also injuring himself in the regular season finale against Michigan. In stepped redshirt sophomore Cardale Jones, who led the team to a blowout win over Wisconsin in the Big Ten Championship Game. The question now was if Cardale Jones still had the magic to keep his team winning. The Buckeyes took an early 3-0 lead. They held Alabama to a three and out and forced a punt. Jones then led his team 80 yards in 10 plays and they settled for the early field goal. After forcing another Alabama punt, Ohio State gave the Crimson Tide good field position when running back Ezekiel Elliott put the ball on the turf and Alabama safety Landon Collins recovered at the Buckeye 33 yard line. Two plays later, sophomore running back Derrick Henry broke loose for a 25 yard TD run to put Alabama up 7-3. Ohio State answered with a field goal on their next drive to cut the deficit to 7-6. Late in the 1st quarter, the Crimson Tide extended their lead when Sims hit Amari Cooper for a 15 yard TD pass to go on top 14-6. In the 2nd quarter, Alabama threatened to break the game wide open. Crimson Tide corner Cyrus Jones intercepted Cardale Jones, giving his team the ball at the Ohio State 15 yard line. Running back T.J. Yeldon scored from 2 yards out and Alabama had what seemed to be a commanding 21-6 lead. The Buckeyes had more yardage than the Crimson Tide, but were having problems getting into the end zone. After the Yeldon TD, Cardale Jones got his offense going. He led his team on a 12 play, 71 yard drive with Ezekiel Elliott running it in from 3 yards out to cut the lead to 21-13. The Buckeye defense forced a three and out and Ohio State had one more possession before the half. Jones quickly drove his team into the red zone, then receiver Evan Spencer threw a beautiful reverse pass to receiver Michael Thomas to cut the lead to 21-20 at the half. As the 2nd half started, it was obvious the Buckeyes had the momentum and they took the lead on their first possession of the 3rd quarter when Jones hit Devin Smith for a 47 yard TD pass. Midway through the quarter, Sims made an uncharacteristic mistake. He attempted to hit Amari Cooper on a slant, but Buckeye defensive end Steve Miller had dropped into coverage. Miller picked off the pass and returned it 41 yards to give his team a 34-21 lead. Sims shook it off and on their next possession, he drove his team 84 yards on only 7 plays. Sims took it the last 5 yards into the end zone to cut the lead to 34-28. Midway through the final quarter, Elliott took a handoff and raced 85 yards to increase his team’s lead to 40-28. 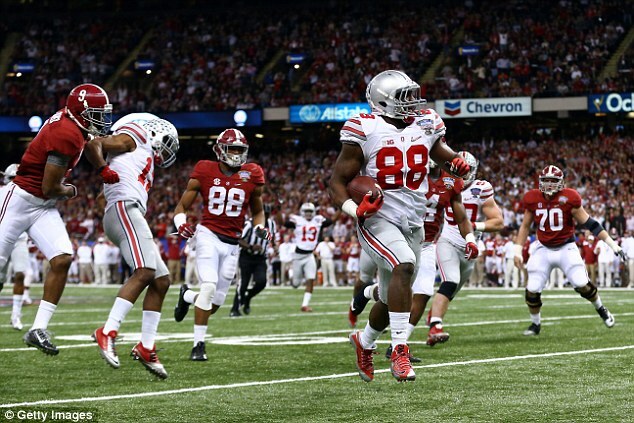 The Buckeyes decided to go for two points and Jones connected with Michael Thomas for the 2-point conversion. Alabama receiver Amari Cooper caught a late TD pass, but that’s all Alabama could muster as they lost 42-35. Ohio State will now go into the championship game against the Oregon Ducks. They will have faced all three Heisman finalists (Melvin Gordon, Amari Cooper and Marcus Mariota) in successive games. I’m not sure any team has ever been able to say that. So far Ohio State has been able to get the win, but this one will be tough, but then again that’s what everyone said about the Alabama game. Cardale Jones, QB, RS Soph (6-5, 250): Only has two starts under his belt, but he has shown that he can perform on the biggest of stages. Has one of the coolest nicknames in sports, “12 gauge” because of his impressive arm strength. Has the size you like to see in a QB and he has surprising athleticism and running ability. Hurdled an Alabama defender on a 20 yard run and has the ability to break tackles. Learning how to look off defenders with his eyes. Throws a beautiful deep ball. Completed 18 of 35 for 243 yards with 1 TD and 1 INT. Ran 17 times for 43 yards. Evan Spencer, WR, Jr (6-2, 208): Versatile player that can do whatever you need done offensively. Physical blocker in the run game. Completed a 13 yard TD pass that was put in the only spot it could be put to complete it. Gives good effort after making the catch. Good vertical jump. Had 1 catch for 7 yards and recovered an Alabama onside kick. Devin Smith, WR, Sr (6-1, 197): Big play threat for the offense. Led the team with 886 receiving yards and averaged and an incredible 27.69 yards per reception with 12 TD. Has a touchdown in 21 straight games. Has the speed to run right past defenders. Tracks the deep ball really well. Great vertical jump ability. Was #2 in the Big Ten high jump at 7’2”. Had two catches for 87 yards. Michael Thomas, WR, RS Soph (6-3, 212): Big body. Led the team with 50 receptions. Great body control. Extremely athletic. Shields off defenders with his body. Had 7 catches for 67 yards, 1 TD and 2-point conversion. Jacoby Boren, C, Jr (6-1, 285): Was the only returning starter from 2013 and was the leader of the offensive line. Undersized but very scrappy. Good movement skills. Able to pull and lead the sweep. Can get to the second level to block linebackers. A tough player that was injured in the 2nd quarter, but returned in the 2nd half. Steve Miller, DE, Sr (6-3, 255): Doesn’t have great size, but has good athleticism. Able to drop into coverage. A smart player that reads his keys and isn’t fooled easily. Stays at home when the play goes away from him. Had a 41 yard pick six. Michael Bennett, DT, Sr (6-2, 288): Prototypical 3 technique in 4-3 alignment. Athletic and quick off the ball. Disruptive player that gets penetration into the backfield. Has the strength to occupy blockers. Pushes the pocket on passing plays. Good motor. Has a good spin move when rushing the passer. Had 4 tackles, 1 ½ tackles for loss and 1 sack. Adolphus Washington, DT, Sr (6-4, 295): Underrated. Has the strength to tie up blockers and control the middle of the line. Does a lot of things that don’t show up on the stat sheet. Had 2 tackles, ½ tackle for loss and 1 batted pass. Joshua Perry, OLB, Jr (6-4, 252): Has the size to play inside. Tied for #3 in the Big Ten with 118 tackles. Always around the ball. Plays downhill and steps up to meet ball carriers in the hole. Had 5 tackles. Doran Grant, CB, Sr (5-11, 193): Team captain and the team’s best cover guy. Was beaten for a touchdown. Had 7 tackles. Blake Sims, QB, Sr (6-0, 208): Former running back. Lacks the size you want from a QB at the next level. Was counted out before the season, but he won the job and had a very good year. Plays better in the 4th quarter, especially if the game is on the line. Highly competitive and doesn’t give up. Holds the Alabama single season total offense record. Very good once he escapes the pocket. Uses his legs to keep the defense honest. Great poise. Completed 22 of 36 for 237 yards with 2 TD and 3 INT. Had 29 rushing yards on 10 carries. T.J. Yeldon, RB, Jr (6-2, 221): Great size. Has over 3,300 rushing yards in 3 years at Alabama. Great combination of size and speed. Playing banged up. Has great feet and is always under control. Had 10 carries for 47 yards and 1 TD. Jalston Fowler, FB, Sr (6-1, 248): Versatile player that can do a little bit of everything. Very good lead blocker. Able to catch balls out of the backfield and can even run the ball in short yardage and 4:00 situations. Had 2 catches for 14 yards. DeAndrew White, WR, Sr (6-0, 192): Underrated receiver. Has the speed to get behind the defense. Runs good routes. Competes for the ball in the air. Had 3 catches for 65 yards and had a 51 yard catch. Amari Cooper, WR, Jr (6-1, 210): Total package as a receiver. If he decides to declare for the 2015 draft, he could the first receiver taken. Moves all over the field and the Crimson Tide try to get the ball in his hands and much as possible. Gets to top speed very quickly. Snatches the ball from the air. Makes the tough catch. Can elevate to get the ball at the highest point. Great route runner. Had 9 catches for 71 yards and 2 TD (one on 4th and 2). Brian Vogler, TE, Sr (6-7, 263): Massive size. Known more for his blocking than for his receiving skills. Big target. Good concentration. Had 2 catches for 9 yards. DJ Pettway, DE, Jr (6-2, 265): Blue collar player. Has good strength and power. Had 1 tackle, 1 tackle for loss and 1 sack. Xzavier Dickson, ILB, Sr (6-3, 268): Big, physical run stuffer that also does a good job rushing the passer. Led the team with 12 ½ tackles for loss and 9 sacks. Runs well to the ball. Good bull rush and blitzes the A gap very well. Had 5 tackles, 2 tackles for loss and 1 sack. Trey DePriest, ILB, Jr (6-2, 250): Fills holes on the inside. Runs sideline to sideline. Stops ball carriers in their tracks. Had 6 tackles, 1 tackle for loss and ½ sack. Cyrus Jones, CB, Sr (5-10, 194): Gets into passing lanes and disrupts patterns. Does a good job reading the quarterback. Jumps routes. Good deep coverage. Had 2 tackles, 4 pass breakups, an INT that led to a TD and dropped a second ball. Landon Collins, S, Jr (6-0, 222): Versatile player with good size that can do it all. Led the team with 102 tackles and 3 interceptions. Playmaker that can play in the box or in coverage. Good blitzer. Plays special teams. Had 12 tackles, 1 tackle for loss, 1 pass breakup and 1 fumble recovery. See ya next Wednesday when I will discuss the Oregon – Ohio State game. If you like what you read, like us on Facebook and tell your friends. This entry was posted on January 9, 2015 by draftmaniacs in Scouting reports and tagged 2015 NFL draft, Adolphus Washington, Alabama Crimson Tide, Amari Cooper, Blake Sims, Braxton Miller, Brian Vogler, CFP25, Cyrus Jones, Dardale Jones, DeAndrew White, Derrick Henry, Devin Smith, DJ Pettway, Doran Grant, Evan Spencer, Ezekiel Elliott, J. T. Barrett, Jacob Coker, Jacoby Boren, Jalston Fowler, Joshua Perry, Landon Collins, Marcus Mariota, Melvin Gordon, Michael Bennett, Michael Thomas, NFL, NFL Draft, Ohio State Buckeyes, Oregon Ducks, Steve Miller, T.J. Yeldon, Trey DePriest, Xzavier Dickson.